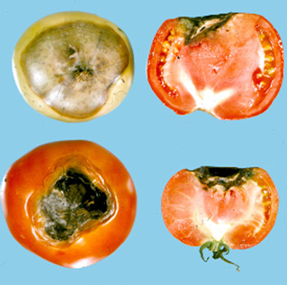 Blossom end rot is a physiological disorder of tomato in which the tissue of the blossom end of the fruit (the portion of the fruit opposite the stem) breaks down and rots, thus reducing yield. Pepper, eggplant and squash (e.g., zucchini) fruits can also be affected. Blossom end rot often occurs on the first fruits formed on plants. Initially, water-soaked spots (resembling small bruises) appear, most often on the blossom ends of fruits. On peppers these spots can resemble sunscald and can form on the sides of the fruits near the blossom end. Spots enlarge, becoming dark brown to black, sunken and leathery. Half the fruit may eventually be affected. Sometimes, when a fruit is cut, the exterior will be sound, but the interior will be discolored and shrunken. Often, bacteria and fungi invade the discolored areas, leading to tissue decay. Blossom end rot is caused by a lack of calcium in the fruit. This lack of calcium may be due to low calcium levels in the soil. More often, there is plenty of calcium in the soil, but its availability for uptake and transport to fruits is impaired. Drought stress, alternating soil moisture extremes, and damage to a plant’s roots all can inhibit calcium uptake, as can waterlogged or cold soils, and high concentrations of ammonium (NH4+), potassium (K+), and magnesium (Mg++) cations in soil. Movement of calcium within plants depends on active transpiration (i.e., loss of water through above-ground plant parts). Because leaves transpire more than fruits, calcium moves more easily into leaves where it remains. Calcium is not later redistributed from leaves to fruits. This preferential distribution of calcium to leaves can be made worse by over-fertilizing with nitrogen which promotes excessive production of leaves. In addition, high relative humidity, OR low relative humidity in combination with hot, windy weather can limit transpiration, thus preventing calcium from reaching fruits. How can I control blossom end rot? Avoid conditions of too much or too little water. Irrigate evenly and mulch the soil to retain moisture during dry periods. Avoid cultivation near plants that would damage roots. Use nitrate (NO3-) rather than ammonium (NH4+) forms of nitrogen fertilizer. DO NOT over-fertilize. Have your soil tested periodically to determine if there is sufficient calcium in the soil. If not, add calcium (e.g., lime, bonemeal, eggshells). Check the soil pH on a regular basis, particularly if you use lime as a calcium source. A pH of about 6.5 is ideal for growing most vegetables. Finally, grow vegetable cultivars that are tolerant of calcium deficiencies and less likely to show blossom end rot symptoms. 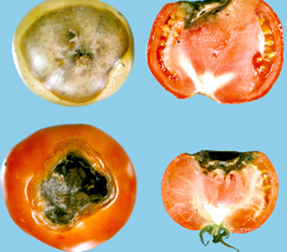 For more information on blossom end rot: See UW-Extension bulletin A3798 or contact your county Extension agent.